Meetings are held on the 3rd Thursday of every month starting at 5:30 pm and ending at 8:00 pm. Time 5:30 p.m. – 8:00 p.m.
Office 365 has come out strong in 2013 with many organizations choosing to add Office 365 in their enterprise agreements with Microsoft. Where SharePoint 2010 and 2013 on premise both have promising features for external collaboration, many companies instead use box or dropbox due to firewall limitations, security, and complex forms based authentication that simply make SharePoint too complex. However, with this surge in Office 365 subscriptions, now pushing 100 million users’, there’s an incredible opportunity to start using SharePoint as an external collaborative tool. In this presentation we will show you real world examples of how organizations are using Office 365 for external collaboration including items such as branding, automatic document uploading, external sharing caveats, and, of course, custom application development. We would like to thank Learn iT! for sponsoring food and beverage at this meeting. Please take a moment to learn more about our sponsor. Learn iT! has provided SharePoint training to businesses globally since SharePoint’s beginning. Working closely with SharePoint developers internally, we custom programs that can better focus on the needs of each identified group. As a Microsoft Gold Partner, Learn iT! understands the robust and dynamic nature of the IT world. We consistently offer the most in-demand certification courses to help your network infrastructure operate efficiently and migrate seamlessly. 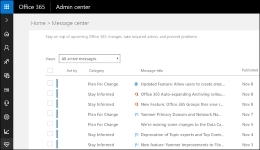 If you’d rather someone else take control of your Office 365 needs it might be a good idea to look into Office 365 Services. It can really speed up a businesses efficiency with the right support.